"Spring Forest Qigong Is Simple Energy Healing... And Is Easy To Learn For All Ages"
Spring Forest Qigong (pronounced "chee gong") will teach you how to remove energy blockages in your body, restore balance and enhance energy flow. When your energy is not in balance, energy blockages are created. If the blockages are not removed, physical or mental illness is likely to manifest. The illness is a symptom of the blockage. Colds, Arthritis, Depression, Inflammation Of The Body – All Diseases – Are Simply Symptoms Of The Imbalance Of Energy Flow In The Body. Spring Forest Qigong practice does not focus on symptoms. It focuses on the energy blockage. It Is Energy Healing... And After Very Little Practice You Can Actually Feel The Energy And Detect Where It's Not Flowing Properly. This is something he teaches in class, and you get hands on practice on your classmates. Not hands on literally, actually there is no touching involved. I started learning with the books and DVD's before I went to a class. I recommend both. It's nice to have the DVD's to look back at once in awhile. The books you get as part of the fee when you attend a class. I attended his level one, two and three classes to learn directly from Master Lin. The energy in the room when Master Chunyi Lin is present is something that can't be described. He's very calm, with a warm smile and gentle manner about him, but you can physically feel his powerful energy. I'm sure you've all experienced people that have a certain presence when they are in a room. Magnify that many times over. "Master Chunyi Lin has developed an easy-to-follow program that will allow you to incorporate the health benefits of Qigong into your daily life." Deepak Chopra, M.D. I have been practicing Spring Forest Qigong since 2003. I had never heard of anything like this before, but when I got an email about it, it intrigued me. However, it seemed to good to be true. Never the less, I saved the email and kept reading it. A few weeks went by, and I ordered the Level One, and Level Two DVDs, and books, and some meditation CDs. Master Lin Teaches, There Is No Right Way Or Wrong Way To Do Spring Forest Qigong. Just Good, Better, Best. So it's possible to start helping others and yourself from the very beginning. Shortly after I bought the information, and I hadn't even looked at all of it yet, I facilitated a healing of my husbands knee, which was scheduled for surgery. He had his pre-op physical, and a few days later we went to the hospital for surgery. When they looked at the knee they sent him home. There was nothing wrong with the knee. We didn't go home we went out for lunch to celebrate. The knee was and is still perfectly normal. Not long after that, I worked on his shoulder quickly one morning before he left for work. It was maybe a week later he said he just realized that his shoulder no longer hurt him. This had bothered him since he was a kid and fell off a railroad bridge. The pain has not returned. I have referred many people to see Master Lin in person. He has helped with Depression , Heart Disease , Chronic Sinus Problems, to name just a few. The mental exercise that you obtain from meditation is as important to your health as physical exercise. It is a fact that stress produces inflammation in your body. I have to tell you, Chunyi says, not everything will be healed and some things take longer than others to be healed. 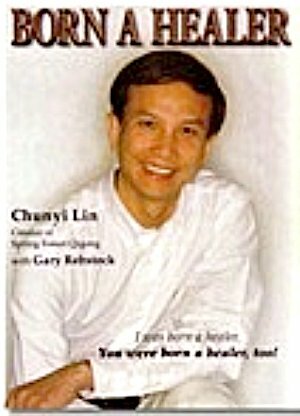 In Born A Healer, and in the Level One for Health DVD and manual, Master Lin explains a very simple, yet powerful technique that you can learn to use in a matter of minutes. You can use this technique to help remove an energy blockage from another person and to relieve pain and promote healing. You Don't Have To Understand The Principles To Experience The Benefits Of Spring Forest Qigong Practice. You Don't Need To Believe In It. "If you believe it, it works. If you don't believe it, it still works. If you believe it will work, it often works faster. Either way, it works, because energy is energy." I referred my cousins husband to Master Lin when he was scheduled for bypass surgery, and repair of his Mitral valve. Chunyi was booked up, so he saw Jim Nance who is another Master healer at Chunyi's office. You have to understand, my cousin and her husband are very negative, and skeptical people. They only went because the heart disease was very serious, and the doctor indicated he didn't know if he'd survive the surgery. At that point they were willing to try anything. The doctor also told them that if he gets the bypasses done, he may not be able to repair the Mitral Valve because of the time factor and the weakened condition of the patient. So they made an appointment at the Spring Forest Qigong office. My cousin was allowed in the room with her husband and Master Nance. She said he worked a long time and the sweat was pouring off of him when he was done. They both felt happy, relieved and optimistic when they left. That feeling and positive attitude remained with them for many months. The energy did something to their dispositions. It was very noticeable how their attitudes had changed. Surgery was two days after the session with Master Nance. The bypass went well, and when the doctor went to do the Mitral Valve, he was surprised that it was completely healed. He could not explain it. He saw the problem on the pictures and now it was not there. The surgeon had no explanation, but my cousin and her husband knew what happened. It was an energy healing by Master Nance that eliminated the Mitral valve problem. The hospital he was at (which was Abbott Northwestern in Minneapolis, MN) for surgery also offered energy healing to the patients there. He used those services whenever he could. They were extremely busy helping people. His recovery went very well. Master Lin Says, "For The Most Powerful Healer, Healing Is The Act Of Sharing Love, Forgiveness, And Kindness"
If you want to be a good healer, you must really love people from the bottom of your heart. Spring Forest Qigong is energy healing. It is also called message healing, information healing, spiritual healing, or signal healing. They are all the same. When you pass energy to help others, you send out healing signals from your mind to others. These signals travel in your energy. Your energy contains considerable information, including the nature of your spirit, purity of your love, and sincerity of your forgiveness and kindness. The level of your healing power depends on the level of love you have toward the person you want to help. It is hard to imagine that a person without love can become a good healer. The more purified your energy is, the more powerful and effective your healing will become. Don't Miss The Opportunity To Share Your Qigong Stories. Best Of All You Have The Chance To Motivate And Inspire People. Did you help yourself or someone else to feel better? Maybe you have some tips for people.